In the wrong hands firearms can have dire effects on the people around them, but in the right hands they can dispense delicious condiments on your hamburger or hot dog! Yes, that’s right, you can now dispense condiments out of a barrel of a gun. You may be interested in this if you enjoy your eggs in the shape of a .45, but you may just enjoy feeling the power of a gun as you drench your fries with ketchup. Finally, condiments are fun again! Think of the boring chore it is to add a line of mustard to your hot dog. 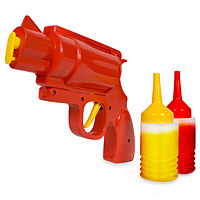 You may want to invest in two condiment guns so you can dispense your mustard and ketchup more freely without having to change cartridges. You can then pretend you are in the wild west as you hold your six shooters on either side of your apron. Your fun will never stop! This is one of those kids love, parents hate type of kitchen items. Like odd shaped cups with crazy straws. I remember a time when you couldn’t find toy guns anywhere. Now they’re everywhere. Probably a plot to raise our kids up comfy with the idea of traveling to far away places, meeting unique people, and killing them. Eek, can you imagine cleaning it! This is so totally useless. Though I’m sure kids would love it, and that’s what the world needs – something to make kids eat more hotdogs. I can see an entire South Park episode revolving around an unfortunate mix up. Bwa, hahahaha! I’m choosing to find this more funny than a disturbing statement of the culture at large. Wow… some people just don’t have a sense of humor! Relax. Condiment guns don’t kill people. Dictators kill people. I think I am going to go buy another deadly gun today. In John of Indiana’s honor. This one more unnecessary item to have around your house- I thought the point of this website was to UNCLUTTER? You’d still need the regular ketchup & Mustard in the fridge to refill. And cleaning this thing out often would be a pain. Before you know it, it’d be in a closet or garage. Definitely not teaching the consumer values this website should promote. The whole problem clutterers have is bringing impulse-buy crap like this in the house they really don’t need. Basically I think of it as reminding us why we do the things we do by showing us what others do so we can shudder at it. LOLOLOL! The first thing that came to mind when I saw this was a mental picture of a couple of these at my sons’ Cub Scout meeting. ’bout spit coffee at my laptop, I did! I had to check the date – i thought it was April 1 again. surely no-one buys these…. I like your unitasker posts. the horrified comments from the people who miss the point more than the post themselves sometimes……. @aaa You totally missed the whole point of the post. It’s POKING FUN at a useless item and in no way condoning its purchase. I must admit, I enjoy unitasker wednesday, but I LOVE the comments the most…I am reminded daily that people are all sooooooooooooo different…. If my 14 year old son ever finds out about this, it’s all over!!!! there will be ketchup and mustard wars all over the neighborhood. Paintball will be a thing of the past! Do they have one for ranch dressing? Nothing goes with a tray of French fries like a .44 loaded with ranch dressing. Fill it with chocolate sauce and get a marshmallow shooter, then you are in business. I’m with Sue….. Food Fight!!!!!! I wonder if I could fill this with something to use at the bar? I laughed ’til I cried when I discovered Unitasker Wednesday! Love it. Maybe people with huge houses and lots and lots of space (not in NYC, for example) would find this appealing. I guess. But it seems like exactly the sort of thing this site would mock as useless clutter.